Each day I spend my fair share of time reviewing a vast number of expired domain auctions to share with others and bid on personally. Although I review a number of aftermarket platforms of expired domains daily, I often use GoDaddy’s aftermarket platform. I actively bid and secure a growing number of competitively-priced expired domains through GoDaddy’s aftermarket platform every week. If you use GoDaddy’s aftermarket platform to bid and purchase expired domains, then you’ll want to continue reading as I share 3 tips to discover expired domains available at hand-registration fee (hand-reg fee). If you are not familiar with the GoDaddy Aftermarket, please allow me a moment to help you get acclimated. For what I’ll share with you today about discovering expired domains available at hand-reg fee, we’ll focus on secondary auction navigation menu selections: Selling List and Bidding List. One of the places I frequently visit when on the hunt for available expired domains at hand-reg fee is bulk searching previous expired domain auctions I didn’t win. I’m amazed at the number of expired domains I didn’t win in auction that are hand-reg available because whomever bought the domain at auction let it expire. Don’t expect all domains when bulk searching. There may only be a handful, 10 or less, of expired domains you didn’t win in auction that are available at hand-reg fee. To get started with bulk searching domains not won in auction, click the Bidding List menu selection, and click the Didn’t Win text to display previous expired domain auctions not won in a table. To download Didn’t Win domains, click the Bidding List menu selection, and click the Didn’t Win green download icon to the right of the text. This action allows for exporting and download of ALL previous expired domain auctions not won. Once successfully downloaded, open the download using Excel (Windows) or Numbers (Mac). Copy the entire row column of domain names, excluding the header row, to the clipboard using Command+C (Mac) or Ctrl+C (Windows) keyboard commands. With the domains copied to the clipboard, you’re now ready to execute a bulk search. From the primary menu, click the “Domains” link, and then click “Bulk Domain Search” text link found under the “Find a Domain” section. Once the page loads and displays the following, paste your entire list of domains not won into the bulk search input texture and click the Go button. Keep in mind bulk search functionality has a maximum 500 domains per search. If you have more than 500 domains to bulk search, then you’ll need to execute multiple searches. Once successfully executed, you’ll be shown whether or not domains are available, registered and available, and/or unavailable (registered). In addition, a “Proceed to Checkout” button is displayed along with functionality to select or unselect all domains, copy all domains, and remove selected domains. Once proceeding to checkout, the experience is the normal GoDaddy checkout experience. It’s not often I bulk search expired domains previously won in auction. After all, I tend to invest and hold most domain investments for a minimum of 5 years. But for the case where I’ve intentionally or inadvertently dropped domains won in auction over the course of time, I’ll find a few domain diamonds in the rough to re-invest in. To get started with bulk searching domains won in auction, click the Bidding List menu selection, and click the Won text to display previous expired domain auctions won in a table. To download the Won domains, click the Bidding List menu selection, and click the Won green download icon to the right of the text. Somewhat like Didn’t Win domains, this action allows for exporting and downloading ALL previous expired domain auctions won. Once successfully downloaded, open the download using Excel or Numbers and perform the same actions as explained with Didn’t Win domains. Simply copy domains to the clipboard, and paste domains and perform a bulk search as explained in the previous section. One of the final places I fish for domains available at hand-reg fee is the Sold section of the Selling List, one of the secondary auction navigation menu selections. Much like Didn’t Win expired domains, Sold domains are not necessarily expired domains, but public domain auctions or domains listed for sale. Nevertheless, I’m amazed at the number of times I’ve checked and identified 3-4 domains I’ve previously sold on GoDAddy that the buyers subsequently dropped. I’ve had success 2 different times re-registering, listing for sale, and selling such domains within 4-6 months of hand registration. It’s always good times to realize the opportunity in hand-regging and profitably selling the same domain to two distinct domain buyers within a two to three year timeline. To get started with bulk searching domains sold in auction, click the Selling List menu selection, and click the Sold text to display previous expired domain auctions sold in a table. To download the Sold domains, click the Selling List menu selection, and click the Sold green download icon to the right of the text. As expressed in previous sections, this actions allows for exporting and download of ALL previous domains sold. Once successfully downloaded, open the download using Excel or Numbers and perform the same actions as previous sections, copying domains to the clipboard, and pasting domains and perform a bulk search as explained in the previous section. 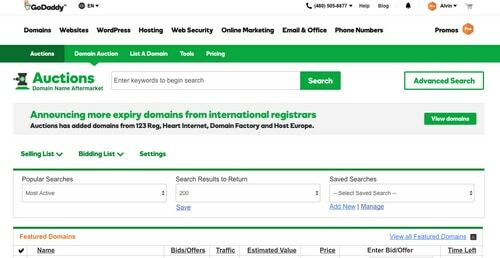 Learning to use GoDaddy’s aftermarket to occasionally check Didn’t Win, Won, and Sold domain listings could land you profitable domain investments and future sales at hand-reg cost. And as an added bonus, I recommend following and tracking the lifecycle of each Didn’t Win domain. Was the domain flipped or leased? If so, at what price (hint, hint: NameBio.com)? Was the domain developed or simply redirected? These are a few of the thoughts and questions that come to mind when managing my GoDaddy aftermarket activity and profitable domain portfolio growth. That’s all for now! Great meeting you at MERGE!, Alvin. Congrats on this new contributing column for DNW. Thanks Theo! It was my pleasure to have met you as well. I’ll be and stay contact. That’s quite true but I did manage to hand-register quite a few expired or dropped domains using my unique own short cut system or indeed probably by pure luck and without any big hassle at all, such as eUrgency.com (Age: approx 17 years) & RiskAccess.com (Age: approx 12 years)! Bob, domain age is only of value when the domain hasn’t dropped. The ones you noted aren’t 17 and 12 years old; they are 2 and 1 respectively. In other words, to brag about age it must show in the current WHOIS. Acro, I think you are bit short-sighted on this. Current WHOIS never shows WHOIS HISTORY especially in case with most domains registered with GoDaddy & other registrars. I only use Domain Tools which does show full WHOIS history which shows “49 records have been archived since 2000-08-25” for EUrgency.com & “51 records have been archived since 2001-11-10” for RiskAccess.com. Again EUrgency.com.com has only been dropped twice since 2000 with 4 registrars & RiskAccess.com has only been dropped once since 2001 with 3 registrars. Also there are sheetshoots going back to 2004 for RiskAccess.com. In other words, I quite agree that if such domain has been dropped too many times in a short period then it must be of no or little value but dropped only once or twice over the years it must still have a relatively value e.g. Estibot appraisal value is $750 for RiskAccess.com. I believe that many good sales have been made from expired or dropped domains or otherwise there is no such market for these. So Domain Age is only shown in the WHOIS history instead of the current WHOIS!